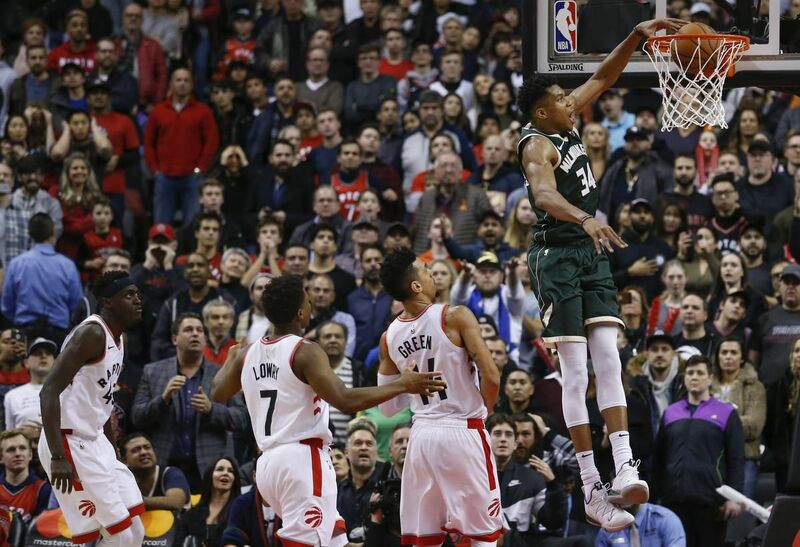 The Milwaukee Bucks defeated the Toronto Raptors for the second time this season on Sunday night, 104-99. Giannis Antetokounmpo recorded a double-double by scoring 19 points and grabbing 19 rebounds. The Bucks signed Brook Lopez in the summer and has been a revitalization, improving his game by shooting three-pointers at almost every chance he has. Lopez finished with 19 points, shooting 5-8 from three. Malcom Brogdon scored 18. Milwaukee was involved in a three-team deal on Friday, as they acquired George Hill from the Cleveland Cavaliers, and Jason Smith from the Washington Wizards. The Bucks sent John Henson and Matthew Dellavedova to the Cavaliers. George Hill did not play in this game. Both Antetokounmpo and Kawhi Leonard missed the first meeting between these teams, but both made up for it. Leonard finished with 20 points and eight rebounds. Serge Ibaka scored 22, Fred VanVleet scored 19 off the bench, and Pascal Siakam scored 17. Kyle Lowry scored zero points, and is in a slump as he has made just four field goals from 28 attempts in his last four games. The last time Lowry scored no points was against the Miami Heat on March 17, 2013. Pascal Siakam continues to show consistency, and speed in transition. The Raptors effort to pull it back in the fourth quarter was not enough, as Milwaukee continues to stay on their tail in the standings. Toronto starts a western conference road trip on Tuesday night when they go up against the Los Angeles Clippers at Staples Center. Tip-off is set for 10:30 p.m. Featured image from Rick Madonik/Toronto Star.